Yasha Spriha is studying English Literature. Yasha is a liberal individual who believes in equality and justice. She is very passionate about women’s literature in specific. Her personal interests include reading, writing, and listening to music. Yasha loves to have conversations and believes in the power of words. India is a secular country according to Yasha, there are several religions coexisting within its national boundaries. As a Hindu Indian woman, her mission is to develop inter-communal relationships and create equality in the Indian society. Yasha believes that the KWLI is an opportunity of a lifetime. She hopes that her time with the KWLI will give her the opportunity to discover new dimensions of her personality and identity. She hopes to create a safer and more respectful environment for women. Her favorite quote is “I am not bird; and no net ensures me: I am a free human being with an independent will.” By Charlotte Bronte. Sampriti Mukherjee is a third year Bachelor of Arts student majoring in Social Sciences with a specialization in Economic, Political Science, and Sociology from Tata Institute of Social Sciences, Hyderabad. Sampriti is passionate about gender rights and eliminating all forms of gender violence, providing better health and sanitation opportunities to women as well as ensuring equality to people of all genders and sexual orientation. She considers herself an ambivert and loves to play violin. Sampriti says the KWLI has been “nothing short of a dream come true.” Sampriti hopes to break away from her cocoon and learn to get out of her comfort zone. Moreover, she hopes she can take the skills she has learned during her time with the KWLI and help empower the women in her local community so that they can live healthier, productive and more enriched lives. Her favorite movie is Forrest Gump featuring Tom Hanks, and the reason for that is because this movie taught her about perseverance and to love herself for whom she is. Saudamini Gupta is studying law with a specialization in constitutional and governance laws. She is a secular person and believes in the power of women. Saudamini enjoys having meaningful conversations about issues related to different communities. She says that India has a reservation policy for making underprivileged classes to be at par for with the privileged classes socially, economically, politically, and educationally. Saudamini hopes to develop as a human and become more sensitive to others. She is excited to apply the concepts of adaptive leadership to her projects back in India. Her favorite quote is “an eye for an eye makes the whole world blind” by Mahatama Gandhi. Aprajita Verma is a Social Science major, specializing in International Relations, Economics, and History. Aprajita strongly supports intersectional feminism and human rights. She sees herself as an active listener and likes to engage in meaningful discussions. Some of her hobbies include reading non-fiction books, listening to music, and playing chess. She says that India remains as one of the few liberal democratic countries that has maintained an open door policy for refugees, migrants, the stateless, and displaced people. Through the KWLI she hopes to deconstruct the idea of leadership and develop a holistic understanding of the dynamic concept of adaptive leadership. She believes that this program has been an insightful journey towards the realization that leadership is a process we must engage in it with all our heart, mind, and soul. Aprajita’s favorite quote is “The idea that some lives matter less is the root of all that is wrong in the world.” By Paul Farmer. Zakia Hmayda is from a small town in Morocco studying Computer Networking. She is currently living with her aunt in a big city o she is facing a new challenge of adjusting to the city life on her own. Zakia enjoys listening to Indian songs and is fascinated by the Indian culture. She watches Bollywood movies and dances in her free time. A fun fact about her is that about 99% of her clothes are different shades of black. In Morocco, there are two dialects that are most commonly spoken in Morocco: Tamazight and Darija. Zakia hopes to gain new friends during her time with KWLI and wants to encourage friends and family around her to get and education because it opens up many opportunities that one would not receive otherwise. Aicha Adoui is majoring in Literature and Human Sciences. Aicha says that Morocco is geographically diverse and is mostly known for tourism. Aicha identifies as Muslim and feels that she is responsible for being a model that represents her religion to be able to clear false stereotypes that have been created towards Islam, mainly in the media. Aicha’s favorite saying is “some of the best things in life are mistakes” and her favorite song is Wake Me Up by Green Day. Aicha’s weakness is caffeine in all its forms. She is also a huge fan of Korean Culture, and actively listens to Korean pop and watches Korean dramas. Khulan Givaasuren is a senior at the National University of Mongolia studying International Journalism. She is excited to spend her time with such encouraging women and thinks it will be a great opportunity for self-development. Khulan believes that the KWLI will help her a create a tight network between the women from across the globe! She also believes that the KWLI will help guide her to find some solutions to the bigger issues facing the women in Mongolia. 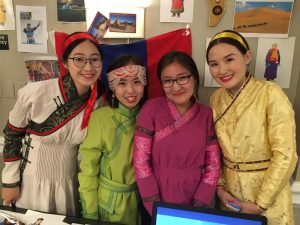 Khulan hopes to learn about the culture and traditions in the United States. Her favorite movie is “127 Hours” and her favorite song is “Ain’t Your Mama” by Jennifer Lopez. Bujinlkham Bandikhuu studies The University of Finance and Economics majoring in Business Economics. Bujnlkham enjoys TedTalks, photography, Russian literature, hiking, and meditating! She says that Mongolia is one of the developing countries in the world with a sky that is ocean blue, which is why it is known as The Land of The Blue Sky. Bujinlkham hopes to enhance her leadership skills through KWLI and develop her network of professional acquaintances and make new friends along the way. Her favorite quote is “A journey of a thousand miles begins with a single step,” by Lao Tzu.